استمتع بوسائل الراحة الراقية في الغرف أثناء إقامتك هنا. بعض الغرف تتضمن تلفزيون بشاشة مسطحة, حوض الاسترخاء, غرف لغير المدخنين, مكيف هواء, مكتب لمساعدتك على استعادة طاقتك بعد يوم طويل. صممت خدمات الاستجمام في الفندق والتي تتضمن مسار جولف - ضمن 3 كم, حديقة, غرفة ألعاب لمساعدتك على الاسترخاء والراحة. إن كنت تتطلع إلى إقامة مريحة وهادئة في سيدني، فستجد في ترافيل لودج ماكواري نورث نورث رايد بيتك الثاني. تتوفر خدمة الواي فاي عال السرعة مقابل رسم إضافي. يوفر مكان الإقامة خيارات استرداد تكاليف الوجبات في مطعم Lachlan. يُرجى الاتصال بالعقار للحصول على مزيد من المعلومات. Extremely convienent location for hospital ,close to shopping centre, also in a safe environment. Very comfortable rooms with everything you need, clean and very reasonably priced room service with very nice food . i think this is a great value for money hotel , it is super clean and great friendly staff, nice quite location , very good size room with modern interior, i think for what you pay this is a great hotel. Sofa bed/lounge was very dusty! Great location close to shops & restaurants! Nice and clean hotel. Great location .5 min to Uni and shopping mall . Less than 10 min to train station. Good location. Just walking distance to shopping mall and Macquarie University. The hotel located about 600 -700 meters from shopping center and my daughter accommodation colledge. It is so convenient. Room is comfortable. Staff are friendly. Best location if you come for the Macquarie university. 5 min walk to everything. Free wifi. Quiet location but most convenient. I had a pleasant stay despite encountering a staff who was aggressive in his attitude and not what i would expect from a manager running a hospitality business. hope they can take this feedback constructive. Close to Macquarie Uni and a short walk to the shopping centre and train station. I've stayed here a few times when visiting my sister at the uni and it's been consistently good, if not amazing. The main complaint would be the poor 3G/4G mobile signal in the rooms, but to be honest that's a symptom of the area generally I've found. I've had the buffet breakfast in the lobby a few times which has been good, but can be a bit understaffed + understocked (e.g. they run out of forks and knife, cups, plates and some food) when large tour groups are staying at the hotel -which seems to have been the case the last few times I've been there. Despite this, it's still my pick for the handy location and the staff are lovely - very friendly and accommodating. I had an emergency and they wouldn't let me change my booking. Totally disgusted. Adoga Were very unhelpful and very unpleasant to deal with. Travelodge were amazing. I would stay there again. But I would never ever book though adoga again. Pro: The location is fantastic. It's near the shopping mall, train station and Macquarie university Cons: 1. The air con is not functioning We went there during summer time Despite turning the air con to the lowest temperature, we can hardly feel the cool air circulating The staff brought the portable fan to our room, however it is hardly enough The room is still very stuffy 2. There are flies in lounge room Irritating but minor problem 3. No swimming pool Being a 4-star hotel, by right there should be swimming pool, no? 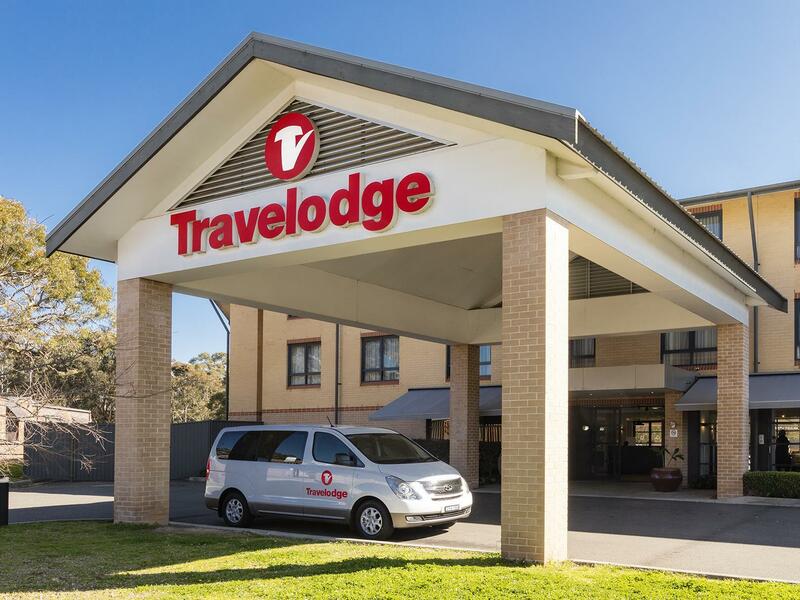 My husband and I stayed at the Travelodge Hotel Macquarie North Ryde when we travelled to Sydney from interstate for a weekend in Sydney. If you have a car the hotel is very conveniently located. It was very quiet (even with the window open), very clean, and all you need if you are just after a bed. It was exceptional value for money. We would definitely stay here again and would highly recommend it to others. Enjoyed my overnight stay to attend 70th birthday. Staff were most friendly and extremely helpful. The location was very quiet with no traffic noise what so ever. Would recommend for travellers to the north side of Sydney. I regularly stay at Travelodge Macquarie. The beds are comfortable and perfect for a short stay, you will require your own transport if wanting to travel around. Cost is definitely reasonable for what you get. It was fine. However the check in process was slow - many people were waiting and only one person was on reception. When I finally got to reception they needed "to hold an extra $50" with a credit card using a PIN. However my credit card only has Pay Wave so couldn't be used for this purpose. I offered to give them cash but apparently this could not be arranged. I then had to find another credit card which I never use, phone my husband for the PIN, transfer money etc etc!! Then after all this we couldn't find the hotel parking and had to return to reception to ask. We had requested twin beds but when we got to our room it was a King bed. By this time we were too tired after 8 hours driving and the problems with check in to complain so we just gave up! We had a good stay the rooms were clean,staff friendly and helpful, location was excellent for our visit, like having an empty fridge with vending machines available. However in our daughter's room (328)(she had a small baby) the window lock was broken as was the airconditioner so she froze the first night as cold air came in through the window and out of the airconditioner. We were there two nights and asked for it to be fixed the airconditioner was but not the window so we had to tape a handtowel over it to stop the cold air. In our room (327) the fridge had a very definite stale milk smell as we were going to a funeral I totally forgot to mention it to the staff until we left, I had tried to wipe it clean (couldn't actually see any spillage) but when the left the smell was as bad as ever. Overall it was a good stay and we would stay there again and recommend it to others. the service, and the room were good. Very clean and attractive colours in my room. I found my stay very pleasant, the room was good. Breakfast was not so good I was disappointed. The quality was not good. Warmed up tinned tomatoes - not good. Fake scrambled egg was very hard and horrible. The toast was the best thing. Not good value for $15.00. Overall my stay was most satisfactory. The staff, both Reception and housekeeping were excellent and the room was all I need for my nine day personal and business trip to Sydney. I ended up staying nine days which were booked by my second day there and it might have been advantageous to relocate to a room at the end of the building further away from the road noise which did disturb me overnight and prevented me being able to open my window. Next time I would request a room at the other end of the building, furthest away from the road as I am a light sleeper. In the evening a cooking smell, in particular the smell of deep frying fish seemed to permeate the building however I could see staff were trying to mitigate against this by opening all the entry doors at the ground level. I was disturbed a couple of morning early by tour group leaders? going along the hallway around my room knocking on the doors of the tour group guests to get them up at 5:00 a.m. Perhaps tour groups could be woken with a phone call. But overall my stay was great and the feedback provided here were not any issues that would be a deal breaker for me.